Undernourished children in Yemen’s district of Hodeidah are far more likely to contract cholera should the disease spread quickly in the hot summer months. A new alert from Save the Children reports conditions are ideal for cholera to spread rapidly, with almost 3,000 suspected cases reported in the first week of July across the country – the highest number seen since the start of the year. In Yemen, the poorest country in the Arab world, an estimated 2.9 million children and pregnant and lactating woman are acutely malnourished.1 Undernourished children are far more likely to contract cholera, as the disease causes violent vomiting and diarrhea. The disease is especially deadly for children under five years and those whose immune systems have been badly compromised by malnutrition. Families in Yemen have already been through so much as war wages on for a fourth year. Children like Lina* are especially susceptible to the deadly effects of cholera. Lina* (8 months) visits a Save the Children supported health facility in Amran to receive treatment for malnutrition. Two of her siblings have already died due to illness. Lina’s* family has been displaced for at least six years. Her parents have already lost two children to illness. Families like Lina’s* are struggling to withstand continued conflict, food reduction and danger in Yemen. Save the Children is on the ground, working to provide children caught in the crossfire with access to food, health care, education and protection. We need your generous gift to support our efforts. Our relief in Hodeidah now includes treating children for life threatening conditions such as malaria and diarrhea. We’ve rehabilitated health centers and hospitals and provided equipment, medicines, and support to help keep the health system functioning. 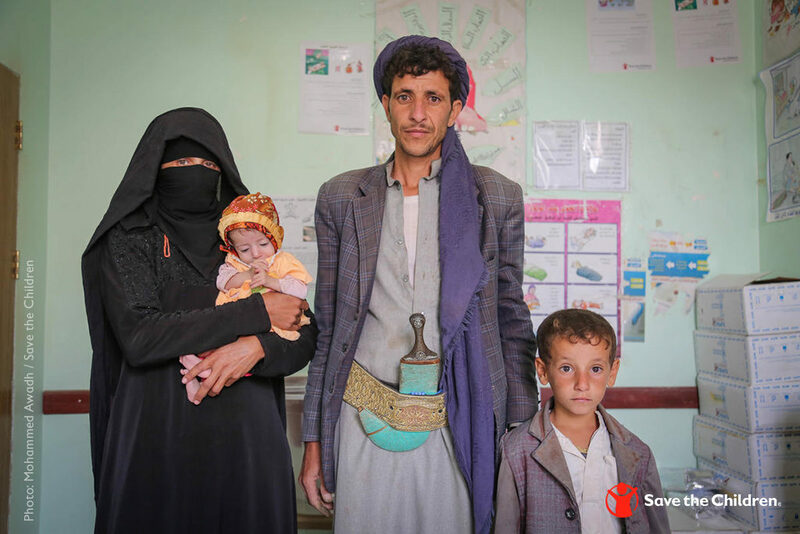 To learn more about the work Save the Children has done in Yemen, visit our website. YOUR SUPPORT CAN MAKE THE DIFFERENCE. 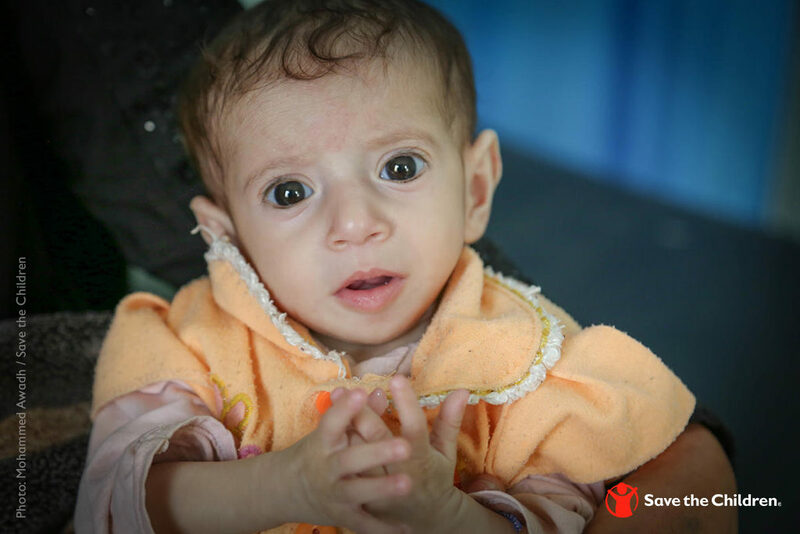 MAKE A DONATION TODAY TO SUPPORT OUR YEMEN CHILDREN’S RELIEF FUND. “I never thought my dream would come true,” says 11-year-old Jennifer, after sharing with us the amazing experience of getting to know her sponsor in person. Over the past year and a half, she and her sponsor had grown a friendship with each letter they wrote to each other. However, Jennifer never expected they would be able to meet face-to-face. Jennifer received news from sponsorship staff that her sponsor, Yu, would be coming to visit her – all the way from China! She eagerly waited to be able to finally hug her and let her know how grateful she is for all of her support. Jennifer and Yu during her welcome ceremony. Jennifer also wanted to tell Yu that her school improved a lot since Save the Children started working there, it became a place where teachers implement new teaching styles that make school fun and exciting. 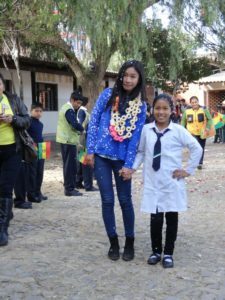 In this part of Bolivia, teachers used to carry out more traditional teaching methods, such as rote memorization, that weren’t appealing to students and made school feel boring and uninteresting. However since sponsorship began showing teachers a new way, classes at Jennifer’s school started to be more centered around children, incorporating games, stories, and theater to keep students engaged. The awaited day finally arrived! And as soon as Jennifer was able to see Yu, the emotion and excitement was so great for both of them that neither were able to hold back their tears. Yu was received at Jennifer´s school with great fanfare. Children, teachers, and parents numbering over 150 people gave her an emotional welcome. Children carried flags, welcome signs and threw flower petals to Yu while the school band played. Jennifer placed a flower garland on Yu’s neck and then took her hand and led her into the school, where they talked, played games and learned more about each other for the rest of the afternoon. Jennifer showing the photo album she made of Yu’s visit. As a reminder of that wonderful day, Jennifer created a photo album of her time with Yu. “This will be my greatest treasure” she says, while she proudly shows us her photos. She loves remembering every moment of this visit, her sponsor’s embrace and all the time she spent with Yu, and fondly flips through the photo album when she wants to recall those feelings of excitement and joy. This is a memorable experience that not many can experience. The joy and emotion a child experiences by having a faraway friend travel thousands of miles to see them leaves traces that will never be erased in their hearts. Did you know you can visit your sponsored child? Contact our team in Fairfield, CT at ChildVisits@SaveChildren.org to learn more! 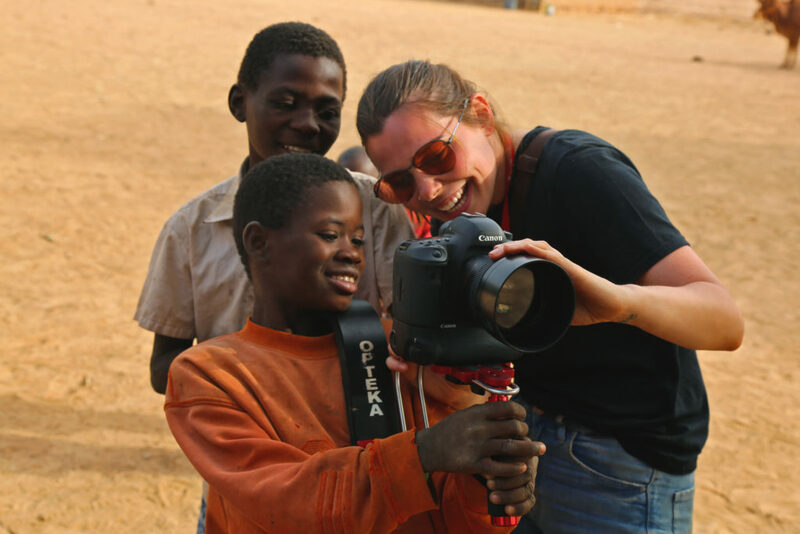 It’s been almost two years now that I have been working with Save the Children – traveling to eleven different countries and a multitude of communities to document firsthand, through photo and video, the positive impact being made by sponsors. During my recent trip to Mali, I had the opportunity to visit a very special village, one that is just beginning to see the impact being made by Save the Children. Why was it so special, you ask? Because, in my opinion, the beauty of a community lies within the people. My first impression upon entering the small village was of a young boy standing across from me. He was wearing an oversized bright orange sweatshirt, and he was smiling at me. I smiled back, and he giggled. 13-year-old Arouna, left, and his 14-year-old brother Mamarou, center, learn from Sponsorship Storyteller Victoria, how to record a video during a visit to the community. Naturally, I took an immediate liking to him because, as an outsider visiting remote locations, a child’s initial reaction to my presence is usually to shy away. After exchanging pleasantries with the school headmaster and teachers, which is a common courtesy in Mali, I had time to meet with some of the sponsored children and ask them to share their stories with me. As I began writing down interview questions in my notebook, I heard voices entering the classroom. As I looked up, there he was! The boy in the orange sweatshirt. I learned his name was Arouna and he was with his mother, Matou. After introducing myself to both, I began the interview with introductory questions, to get to know Arouna and the small village he calls home. It was at that moment I knew I wanted to be one of Arouna’s new friends. There was something about him – he seemed so very special. During our interview, I learned that Arouna is 13 years old and in sixth grade. His father passed away last year leaving the family with very little to survive. Arouna’s sisters went to stay with other family members and his older brother Mamarou, who is only one year older than Arouna, dropped out of school to work in the cotton fields, to provide food for their family. Now, Arouna is the only child in his family who is attending school. Following the interview, I was able to capture moments of Arouna learning in the classroom, playing with friends and spending time with his family. Over the course of the two days I spent in his small village, Arouna and I created our own handshake, learned some English words together like ‘book,’ and he even helped me operate my camera! Although we weren’t able to verbally communicate without a translator, we formed a bond. I was so deeply touched by Arouna’s story and his family’s hardship. I felt a strong desire to tell him that I believed in him. I was afraid that if Arouna’s family continued to struggle, that his fate would end up the same as his brothers. 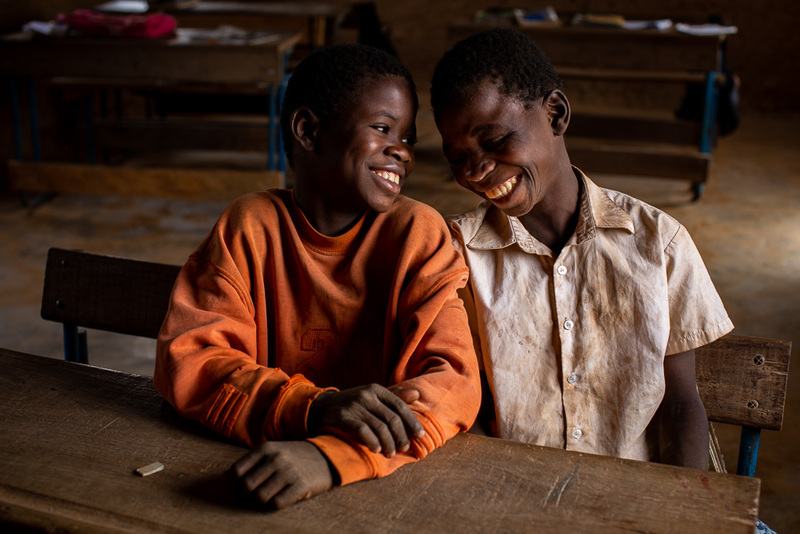 13-year-old Arouna, left, and his 14-year-old brother Mamarou, right, share a laugh inside of the community school which Arouna attends. Before I left Arouna’s community, I gave him a red leather-bound notebook to take to school. On the inside cover of the book I wrote him a note in his local language, Bambara. You can achieve anything you put your mind to. Best of luck to you in your future. As a sponsor, it is important for me to let children know that they have someone on the other end of the world who believes in them. As sponsors, we provide hope and inspiration to so many children like Arouna. These words are something they will cherish for a lifetime, allowing them to believe in themselves and succeed. Fathers play an important role by assisting mothers with Kangaroo Mother Care, a technique where skin-to-skin contact and breastfeeding offer newborn babies warmth and nutrition during the most critical stage – the first 24 hours. However, in many cultures, fathers are reluctant to participate in perceived maternal techniques. 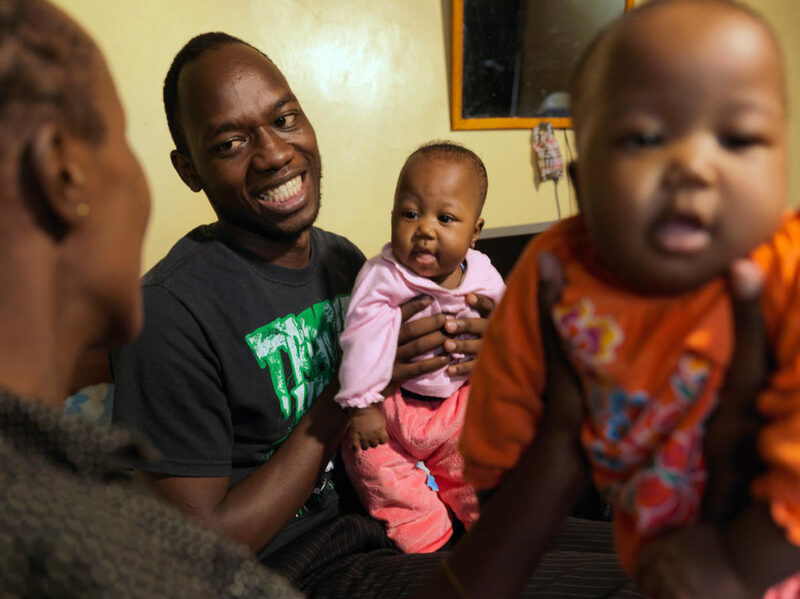 Here is the story of one such father and how he is working to redefine gender roles for Kenyan fathers. In Nairobi, Kenya, William works as an assistant tutor to provide for his young family. Every morning, he prioritizes spending time with his twin babies in their one-room home before beginning his day. “I always wake up around 5 a.m. so I can hold each of them before I start preparing myself for work,” he says of 7- month-old Audrey and Amber. He proudly adds that now that his girls are healthy 7-month olds, they squeeze in some playtime before he leaves home. Holding both girls in his lap, he recalls his first weeks as a father, when he spent hours of each day praying for their health after they were born three months premature. Weighing about 3.5 pounds each at birth, Audrey and Amber spent over two months in the hospital while their health and weight improved. William visited every day after work, anxiously wondering during each taxi ride whether his newborns had lived to see another day. Save the Children is strengthening the skills and capacity of health providers in seven hospitals located in the Langata area of Nairobi, Kenya, so that they can deliver higher quality care to preterm and low-birth-weight babies. The project is targeting to reach 2,200 new born babies each year, including William’s twins Amber and Audrey. In Nairobi, most hospitals face the challenge of not having enough incubators to meet demand, so it’s not uncommon to see four tiny newborns sharing one machine. When William arrived to visit his family at the hospital, he’d often learn of newborns in the same unit who hadn’t survived. But with help from a Kangaroo Mother Care (KMC) program supported by Save the Children and Red Nose Day, both girls grew to become healthy babies. KMC is the practice of providing skin-to-skin contact between a caregiver and newborn. The technique decreases mortality by regulating the baby’s temperature, breathing and heartrate; promotes breastfeeding and provides an opportunity for parent-baby bonding. Audrey and Amber responded immediately to KMC and began gaining weight at a rate of about 4 ounces per week. William was impressed by the progress but a common social stigma regarding traditional gender roles kept him from expressing his interest in KMC. “In the African culture, there is this thing that kids are supposed to be taken care of by the mom,” he explained. After two and a half months of practicing KMC in the facility, Audrey and Amber were finally healthy enough to be discharged. Once at home, William began assisting his wife with KMC. They’d spend their nights sitting side-by-side, each with a baby on their chest in Kangaroo position. increased by over a pound. William was convinced that he should continue as a key player in the twins’ KMC journey. YOUR SUPPORT CAN MAKE THE DIFFERENCE. MAKE A DONATION TO SUPPORT OUR WORK IN KENYA AND AROUND THE WORLD. Save the Children’s Saving Newborn Lives program is a project that aims to reduce newborn deaths and improve newborn survival in high-mortality countries in Asia, Africa and Latin America. Health workers present when the baby is born can help the mother establish exclusive breastfeeding, and can support the mother to keep the baby warm through skin-to-skin contact – a technique known as Kangaroo Mother Care. Fathers play an important role by assisting mothers with KMC. Save the Children is taking action to assist children and families affected by U.S. immigration policy in recent months, and to strengthen our work to address the root causes of migration from Central America. Bringing decades of humanitarian expertise, we seek to sustain and strengthen our ongoing work in El Salvador, Honduras, Guatemala and Mexico, where pervasive and often ruthless violence has families living in fear for their lives and safety. Save the Children has a strong presence and longstanding child- and youth-focused programs in the countries of origin for the majority of migrating children, adolescents and families, and in Mexico, which is both a source and transit country. We have used our presence and expertise to launch humanitarian programs to protect children, address the needs of children returning from the U.S. and reduce violence. We seek to prevent dangerous and forced migration through activities such as awareness campaigns on the risks and rights associated with migration and programs related to youth empowerment, jobs training and family livelihoods. We also strengthen national protection systems to care for children and adolescents in their home communities, as well as during transit and return, including family reunification, so that they can access their rights to dignity, protection and security. Pilot projects to interrupt the cycle of gang violence in El Salvador and to create “Schools of Peace” at 70 schools in Guatemala, Honduras and Mexico. 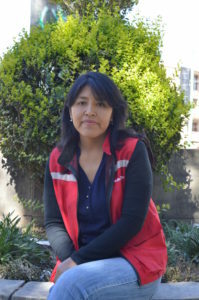 A collaboration among Save the Children, the Mexican Agency for International Development Cooperation, the Secretary of Social Development and the German Cooperation Development group to prevent the migration of unaccompanied children from targeted communities by enhancing their livelihoods and life skills opportunities. Advocating for violence reduction at the community and government levels in Honduras and Guatemala. Preventing trafficking and smuggling of women and youth at risk or victims of human trafficking in Honduras, El Salvador and Guatemala. Improving protection systems for children who have been displaced and/or returned to El Salvador and Honduras after migration. Providing sexual and reproductive health services to returning adolescents in El Salvador and Guatemala. Working to ensure that children in border shelters in Mexico are being protected from harm and have access to psychological and emotional support activities. Save the Children is the national leader in child-focused disaster preparedness, response and recovery. We have over 80 years’ experience serving the needs of U.S. children and have well-trained national staff ready to deploy anywhere at a moment’s notice to assess needs, help protect children and provide critical relief. We are a partner of the Red Cross and a member of National Voluntary Organizations Active in Disasters. We are also one of the few organizations in Central America with longstanding programs primarily focused on children and adolescents in El Salvador, Honduras, Guatemala and Mexico. Each year, we reach 2.8 million children in these countries with protection, health and education programs. Save the Children was founded in 1919 on the pioneering belief that every last child has the right to survive, learn and be protected. Today, we continue this work, advocating for children facing inhumane treatment and potential irreparable harm at the U.S.-Mexico border. Through all of the complexities of this crisis, one thing is clear and simple: we can and must do more to protect children and keep families together. To learn more about the work Save the Children has done in Guatemala to protect children so they are safe in their home communities, read our photo-essay on Medium. YOUR SUPPORT CAN MAKE THE DIFFERENCE. MAKE A DONATION TODAY TO SUPPORT OUR BORDER CRISIS CHILDREN’S RELIEF FUND. 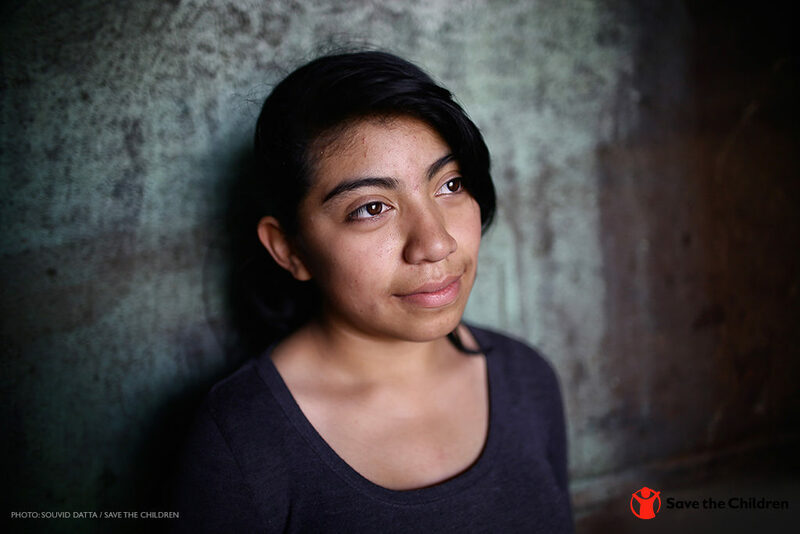 In response to this crisis, Save the Children is announcing new and expanded efforts to support vulnerable children, including supporting programs here in the United States, strengthening family reunification efforts, programming to address root causes in Latin America and continuing to speak out against policies that are harmful to children. Save the Children is calling on all people who care about kids to use your voice and take a stand with Save the Children. This post originally posted by Save the Children Action Network. It is difficult to imagine hearing the panicked cries of children being separated from their families, but this is the reality happening at the U.S.-Mexico border. The separation of migrant families at the border has been the subject of intense media scrutiny and outrage. Even if the issue of family separation were to be resolved, children are still negatively impacted by indefinite family detention, with their well-being at risk. Harms family relationships and stability – Family separation can permanently damage familial relationships, even after reunification. Many children don’t understand why the separation is happening, and feel that their parent has abandoned them. The American Academy of Pediatrics explains that “detention itself undermines parental authority and capacity to respond to their children’s needs,” and results in fraught parent-child relationships. Damages psycho-social development and well-being – Detention involves experiencing a loss of control, isolation from the outside world and detachment from community and culture. These experiences are harmful for people of all ages, but have a higher impact on children because their brains are still developing. The president of the American Academy of Pediatrics said that detention affects children’s brain chemistry in a way that is comparable to child abuse. Research has shown much higher rates of depression, anxiety, PTSD and suicidal thoughts in children who have been detained. Worsened school performance – Detained children often experience impaired or delayed cognitive development, which affects concentration and other abilities that are crucial to academic success. This makes keeping up with the age-appropriate reading and math level especially difficult for detained children. Even once their period of detention is over, their learning capabilities are already behind those of their peers. Poor sleep quality – The lack of bedding for children sleeping on concrete floors, coupled with the mental stress they are under, often results in sleeping problems such as insomnia, sleepwalking, bedwetting and night terrors. Poor sleep quality, in turn, can have detrimental effects on physical and mental health. Risk of exploitation and abuse – Children are at higher risk of being exploited or abused while in detention centers. There have been reports of privately run detention centers paying extremely low wages to detainees for their labor, as well as experiences of physical and sexual abuse from guards and other officers. Some detention centers have been reported to use severe disciplinary measures to control children’s behavior, including drugging children without consent. In order to help children address these consequences and prevent more children from having to experience them, we must contact our members of Congress and urge them to put the best interests of children first. YOUR SUPPORT CAN MAKE THE DIFFERENCE.